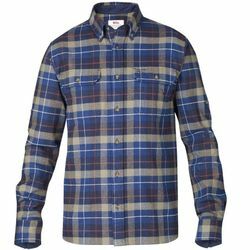 Fjallraven Singi Heavy Flannel Shirt. Long-sleeved outdoors shirt with button-down collar and regular fit. Made from soft cotton flannel with G-1000 reinforcements on the inside of the collar, sleeve cuffs and pocket flaps. Two chest pockets with pen holders. The sleeves can be rolled up and kept in place with a button.